The Global Fleet management space has witnessed a rise in the adoption of new solutions on a global front and the introduction of technologically advanced, more sophisticated solutions with new features that go beyond the standard GPS tracking capabilities. The major factors leading to this development include the rising awareness of the vast benefits of fleet management systems, volatile fuel prices, rising concerns regarding CO2 emissions produced by the transportation industry, the subsequent implementation of several stringent emission-related regulations, and the need to properly manage the increasingly complex operations of commercial fleet-based companies. In addition to the conventional services such as satellite positioning, data logging, and connectivity to a central network for real-time data transfer steadily making a shift from the dominance and data communication, the global Fleet management is of standalone fleet management systems to subscription-based systems, which were earlier adopted mainly by small- and mid-sized companies. Moreover, Cloud-hosted services based on recurring and usage-based service fees are emerging as the most popular choices among large- scale commercial fleet-based organizations as well. With the introduction of core telematics, wireless networks and advanced Fleet Management software in the space, the productivity ratio of Fleet management industry has further increased. Developed regions such as Europe and North America are currently the dominant regional markets for fleet management with the help of highly developed and vast expanse of wireless communication networks, strict traffic regulations mandating the installation of a variety of fleet management systems on fleet-based as well as consumer vehicle and high level of awareness among commercial fleet-based operators. However, the increased availability of economic management services through the cloud deployment medium can help in increasing the adoption of fleet management among small and mid Tier fleet-based operators situated in the developing economies of Asia-Pacific. 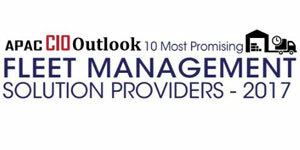 With a more profound insight on the Fleet management market and its influence in the Asia-Pacific, the editorial team at APAC CIO Outlook has critically evaluated a slew of Fleet Management service providers and handpicked 10 vendors on the basis of their technical expertise as well as their business understanding prowess. This particular issue of APAC CIO Outlook unveils some of the most prominent Fleet management solution providers in APAC that have been able to deliver phenomenal results year-after-year by joining forces with their clients.